NECi Superior Enzymes began life in 1993 as The Nitrate Elimination Company, Inc. to commercialize a "battery-powered" enzyme system for removal of nitrate from drinking water. The key enzyme was nitrate reductase (NaR), the focus of Dr. W.H. (Bill) Campbell's academic research on plant metabolism. The work was published in Nature and attracted a flurry of inquiries - plus a market for nitrate reductase. Dr Campbell and Ellen R. Campbell plunged headlong into the business world. Within a few years, it became clear that the timeline for a practical drinking water treatment system remained far in the future - but it also became clear that nitrate reductase could replace cadmium or other metals in widely used methods for detection of nitrate. The Campbells redirected their focus to analytical chemistry. Enzymes are great for analytical chemistry: they are safer for the user, accurate in complex mixtures, and environmentally benign. However, production of proteins from their native sources ranges from impractical to impossible: for example, seeds for the unique feed corn cross that produces enough nitrate reductase for R&D became unobtainable by 1995. Weeks of intense effort were required to produce enough corn seedlings to yield a milligram or two of purified enzyme. By the late 1990s, it was clear that a time would come when NECi would not be able to meet demand for nitrate reductase. Dr. Campbell's academic research moved early into recombinant protein expression. These new technologies were migrated to NECi's scientists, thanks to a grant from NIH in 1998. The first recombinant nitrate reductase was released to the market in 2001. NECi's recombinant nitrate reductase is a reliable and cost-effective reagent for nitrate detection. Enzyme-based nitrate detection is now a standard method with the US Geological Survey and ASTM International. NECi's nitrate reductase dominates the biomedical research market for nitric oxide synthase activity kits. Standard method status for regulatory compliance under the US EPA's Clean Water and Safe Drinking Acts is slated for 2016. NECi Superior Enzymes has focused on making its nitrate assay the best there is, in the lab and in the field. Now we're addressing this question: If nitrate reductase works so well, what other enzymes can do the trick for measuring other analytes? The answers are in our work today, designing and making recombinant reagent grade enzymes, test methodologies, and tools to analyze the invisible world around us. In the mid-1970's, Dr. Wilbur H. Campbell was completing his final post-doctorate degree from Michigan State University, where he began studying Nitrate Reductase in soybean cotyledons. By 1979, Dr. Campbell was working as an assistant professor of Chemistry at State University of New York College of Environmental Science and Forestry, specializing in the biochemistry of nitrogen metabolism in plants. At the same time, Ellen Campbell had began an internship in the pharmacology department of SUNY's medical school, where she had discovered research after realizing her interest in chemistry from studying herbal medicine. Here they met, later got married in 1981, then left for a sabbatical in Germany six months later. A few years later, Dr. Bill Campbell accepted a position in the Department of Biological Sciences at Michigan Technological University in Michigan's Upper Peninsula. Ellen became Bill's laboratory manager, and together they set up facilities to conduct monoclonal antibody and molecular biology research from scratch, neither having any experience doing so. They were successful, as Dr. Campbell's publication record shows. During the late 1980's, a small business in Germany, MoBiTech, contacted the Campbell's about purchasing nitrate reductase purified from corn seedlings using monoclonal antibodies to use in their work on an immobilized enzyme system for the removal of nitrate from drinking water. The Campbells saw this as an opportunity to fund a couple of work-study students at their laboratory at MTU, so they developed a bench-scale enzyme production system. This would satisfy research requirements for structure/function studies as well as provide extra protein for the small research company in Germany. Together, Dr. Bill Campbell and MoBiTech published a paper on the nitrate removal system in Nature in 1991 while the Campbell's were on sabbatical in Stockholm. In 1992, The New York Times interviewed Dr. Bill Campbell about the nitrate removal system and published the article in the SCIENCE WATCH section on March 10th. Following the publication, they received an influx of letters and calls from wastewater treatment plant managers, owners of residential communities, and concerned homeowners looking for a means to remove nitrate from drinking water. The Campbell's had no idea that nitrate was a serious issue. The Campbells incorporated as a Michigan Subchapter S in May 1993 as The Nitrate Elimination Company, Inc (NECi) hoping to sell an immobilized enzyme system for the removal of nitrate from drinking water based on the Nature paper a few years down the line. Sigma Chemical Company was NECi's first customer, and they acquired a small loan from a local bank for start-up funds. In 1995, NECi received their first SBIR grant from the U.S. EPA for developing the nitrate removal system and gained two new customers who purchased Nitrate Reductase for their own nitric oxide research products. After learning more about the water treatment market, the Campbell's decided that bootstrapping was not a viable option. The Nitrate Elimination Company, Inc. decided to concentrate on selling enzymes for nitrate detection while developing the water treatment technology. Nitrate is a potential environmental contaminant that must be monitored and controlled in drinking water, groundwater, and waste water. It is considered a "primary contaminant" that all water systems and industrial effluents are required to measure. The most widely used and accepted method uses the toxic heavy metal cadmium to convert nitrate to nitrite, which then is analyzed using color reagents. The founders of NECi discovered that nitrate reductase could replace cadmium in this reaction, so they decided to focus their attention on commercializing a nitrate analysis method using environmentally benign enzymes. These enzymes were extracted and purified from corn seedlings using monoclonal antibodies during the early stages of the company. In 1996, the USDA granted NECi Phase I and Phase II SBIR funding to develop easy to use nitrate test kits for the consumer market for the use in households and on farms. Salaries paid to the Campbell's from the SBIR awards got fed back into the business for further development. YSI, Inc., a company selling environmental and industrial monitoring devices began using NECi for contract enzyme production for their biosensor products. By the end of the 1990's, NECi grew out of their facilities and bought Lake Linden's old post office, built in 1932, for a deal. NECi acquired a Phase I grant from the DOE in 2001 for the development of a nitrate biosensor, and applied for a working capital loan from the local economic development organization. A methods development chemist from the US Geological Survey began working on adapting nitrate reductase to automated laboratory analyzers (segmented flow injection analyzers and discrete analyzers). NECi started running out of nitrate reductase to sell - purification from corn seedlings couldn't keep up with the demand. A grant from the NIH SBIR program funded expression of Nitrate Reductase in the Pichia pastoris protein production system. Dr. Bill Campbell's academic research was established in these new techniques. Nitrate reductase is a large and complex dimer which requires three cofactors for catalytic activity, so it wasn't possible to make using E. coli, which was the vector of choice at the time. No one had tried expressing anything as complex as Nitrate Reductase into any system by the year 2000, so NIH gladly funded the pioneer project. By 2002, NECi offered the first recombinant form of Nitrate Reductase, YNaR, and a second more optimized form, AtNaR, a couple of years later. 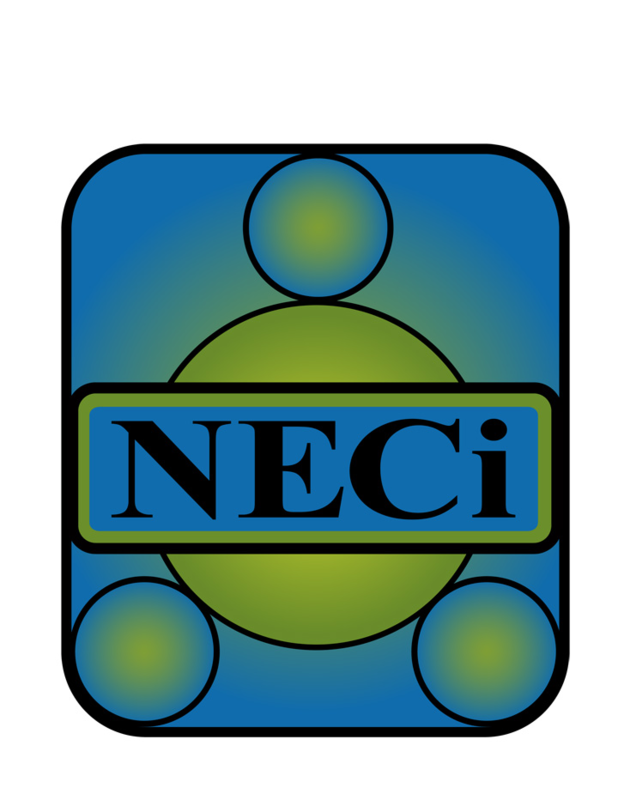 The Nitrate Elimination Company, Inc. developed a new logo shortly thereafter to begin marketing their products under the brand name "NECi" to reflect on the company's history while not implying a nitrate removal system but rather a nitrate testing system. In 2003, small profits were finally being made rather than requiring more personal investment to grow, and a wing was added to the building to expand product assembly and shipping functions. Over the years, NECi acquired more funding and awards to continue developing enzyme-based methods for analytical chemistry. In 2010, the USDA funded research on an enzyme to be employed in field kits for agricultural use. In 2013, the USDA granted NECi Phase I funding to develop an enzyme-based glycerol detection method. In 2014, The National Science Foundation granted NECi with funds to develop a handheld photometer for field testing phosphate and nitrate in soil samples. By 2015, it was clear that The Nitrate Elimination Company, Inc.'s name no longer reflected its direction, but its rich history. 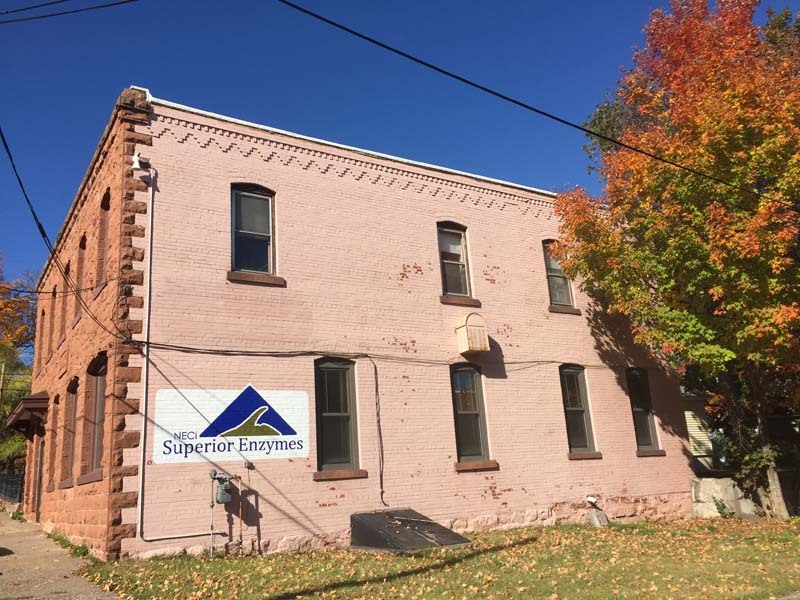 The Nitrate Elimination Company, Inc. re-branded to NECi Superior Enzymes, developed a new focus and logo, and bought the historic bank building in Lake Linden in preparation for expansion.